This page will give you all the product facts for liposomal vitamin C and liposomal Glutathione. You will see the benefits of these vitamins. Powerful “antioxidant” in the blood and cellular tissues throughout the body and is vital for the maintenance of good health. Important aid in the development and maintenance of bones, cartilage, teeth and gums. Helps in connective tissue formation. Helps the body to metabolize fats and proteins. Vitamin C is often attributed to its role as an antioxidant. However, it is much more than that.  No other antioxidant can perform the many additional physiological and biological roles that vitamin C fills. Liposomal vitamin C delivers up to 200% more vitamin C to your cells, tissues and organs than regular oral vitamin C supplements! Vitamin C, or ascorbic acid, is one of the 50 essential nutrients we need everyday for optimal health. Vitamin C is needed for collagen production, one of the more important structural proteins of the skin, tendons, bone, teeth, cartilage and all other connective tissues. Vitamin C is needed for proper neurotransmitter production, compounds that help to regulate mood, but vitamin C is best known for its role as a powerful antioxidant both in the blood and in tissues & cells throughout the body including the brain. Vitamin C helps to prevent and even reverse this from happening by protecting us from free radicals and reactive oxygen species that are generated during normal metabolism, but also from the free radicals through exposure to toxins and pollutants: first or second-hand smoke, exposure to, and the metabolism/breakdown of recreational and prescription drugs, alcohol, air pollution, inflammation from trans fats and diets high in sugar, as well as the toxins produced by viruses, bacteria and other pathogens that our immune is faced with everyday. Vitamin C can help our cells return to normal healthy cells by reversing this oxidation. More Liposomal Vitamin C Product Facts. It supports all dietary philosophies: Paleo, Zone, Mediterranean, vegetarian, vegan general healthy eating guidelines (Canada’s Food Guide), and more. Each carton has 30 sachets. Why do we need GSH (Glutathione)? Every cell in the body needs GSH (glutathione sulfhydryl). When a cell is depleted of GSH, it dies and eventually so do the tissues and organs. As we age, our body’s GSH production diminishes, leading to a detrimental drop in the cellular functions that help maintain a healthy heart, brain, eyes, liver, kidneys, pancreas, and joints. This is why doctors and medical researchers all over the world are encouraging people to increase GSH levels in their bodies. What Makes LivOn Labs’ Lypo-Spheric™ GSH Unique? Traditional oral forms of GSH are destroyed by the body’s digestive juices and stomach acid, and it’s been said the only efficient way to boost GSH levels is through time-consuming, uncomfortable and expensive intravenous injections. LivOn Lab’s Lypo-Spheric™ GSH encapsulates the GSH in liposomes made from Essential Phospholipids, which protect it from being destroyed by digestive juices. Within minutes of taking Lypo-Spheric™ GSH, the tiny liposomes filled with GSH are transported directly into the bloodstream, and into the cells. This makes Lypo-Spheric™ GSH one of the most efficient, highly absorbable and cost-effective ways to boost your levels of this essential antioxidant into your cells, tissues and organs. This is the same material that makes up your cells – allowing the nutrient to pass through cell membranes, intact and ready to work. No bowel intolerance issues means more of the nutrient reaches your cells. Glutathione is referred to as the master antioxidant. Your body does produces glutathione, however many things we face in everyday life deplete glutathione levels such as pollution, toxins, aging itself, poor diet, medications, stress, and infections. Also, glutathione levels decrease significantly as we age. This can leave your cells susceptible to increased oxidative damage (oxidation is what happens to an apple core when it is exposed to air). Glutathione levels have been shown to decrease further as diseases progress. While glutathione serves as a very important antioxidant, it is also crucial for normal detoxification by the liver; without it, you would die. In fact, Tylenol poisoning is due to the depletion of glutathione which occurs as the liver detoxifies the Tylenol; the glutathione is simply used up. Glutathione is needed for the removal of heavy metals as well including lead, mercury, arsenic and more not to mention all the other thousands of toxic industrial chemicals found in the environment today. All have to be detoxified by the liver. These are important product facts. More Glutathione Product Facts. It is essential to maintaining a healthy immune system, it is the first line defense against cancer.